Set of 3 brand new aftermarket replacement blades for Bush Hog Models EFM600, RDTH60, RFM60 and TH60 60 rear mounted finish mowers. The blades replace Bush Hog part number 82324. Each blade is 21 inches long, 2 ¼ wide, ¼ inch thick with a ½ center hole. Thanks for looking and please check out my feedback and other auctions. We attempt to provide great products at the most reasonable price possible. Sorry, there is no negotiation room. 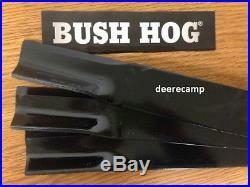 The item "Set/3 Bush Hog 82324 finishing grooming mower blades RDTH60 and TH60 BushHog" is in sale since Monday, July 14, 2014. This item is in the category "Home & Garden\Yard, Garden & Outdoor Living\Lawnmowers\Parts & Accessories". The seller is "mid-mo" and is located in Dutzow, Missouri. This item can be shipped to United States, Canada, United Kingdom, Denmark, Romania, Slovakia, Bulgaria, Czech republic, Finland, Hungary, Latvia, Lithuania, Malta, Estonia, Australia, Greece, Portugal, Cyprus, Slovenia, Japan, China, Sweden, South Korea, Indonesia, Taiwan, South africa, Thailand, Belgium, France, Hong Kong, Ireland, Netherlands, Poland, Spain, Italy, Germany, Austria, Russian federation, Israel, Mexico, New Zealand, Philippines, Singapore, Switzerland, Norway, Saudi arabia, Ukraine, United arab emirates, Qatar, Kuwait, Bahrain, Croatia, Malaysia, Brazil, Chile, Colombia, Costa rica, Dominican republic, Panama, Trinidad and tobago, Guatemala, El salvador, Honduras, Jamaica, Antigua and barbuda, Aruba, Belize, Dominica, Grenada, Saint kitts and nevis, Saint lucia, Montserrat, Turks and caicos islands, Barbados, Bangladesh, Bermuda, Brunei darussalam, Bolivia, Ecuador, Egypt, French guiana, Guernsey, Gibraltar, Guadeloupe, Iceland, Jersey, Jordan, Cambodia, Cayman islands, Liechtenstein, Sri lanka, Luxembourg, Monaco, Macao, Martinique, Maldives, Nicaragua, Oman, Peru, Pakistan, Paraguay, Reunion.